If you'd like to cut additional fat from this zesty snack mix, use 5 sprays of butter-flavor nonstick spray instead of butter. Be sure to add the spray right before eating to prevent the popcorn from getting soggy. In a large bowl, combine popcorn, almonds and sesame sticks. In a microwave-safe glass measuring cup, microwave butter, uncovered, on 100 percent power (high) about 30 seconds or until butter melts. Stir in garlic powder, onion powder and, if you like, curry powder. 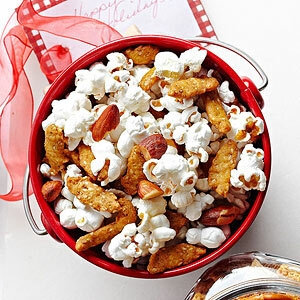 Drizzle butter mixture over popcorn mixture; toss well to coat and serve immediately. Makes 12 (2/3-cup) servings. Place popcorn mixture in a resealable plastic bag or airtight container. Store at room temperature up to 1 day.